For the third consecutive year, global hunger has gotten worse, and this year the numbers have hit their highest since 2009, with the United Nations pointing the finger at climate change as the key cause. 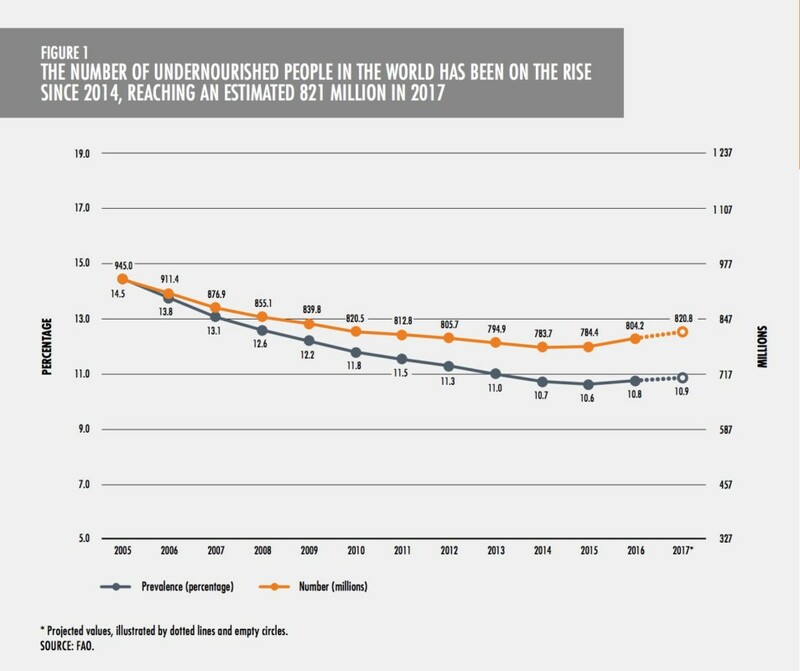 As of this year, the number of hungry globally has reached 821 million, according to a new report by the UN’s Food and Agricultural Organization (FAO). The absolute number of people facing chronic food deprivation was 804 million people in 2016 and 784 people in 2015--levels last seen a decade ago. In other words, one in every nine people worldwide doesn’t get enough to eat. Even worse, 22.2 percent of children under five were affected by stunting in 2017 due to hunger. What is causing these scary figures? The main culprit is climate change and these figures might become even scarier if countries fail to tackle the problem and work to build up resistance to its unavoidable consequences, the report warns. The number of extreme climate-related disasters has doubled since the early 1990s, with an average of 213 annually from 1990 to 2016, harming agricultural productivity and leading to increases in food prices coupled with losses in income. It’s simple math that reduces access to food. Data from the FAO study shows that the number of undernourished people tends to be higher in countries highly exposed to climate extremes. As such, climate change is threatening to erase any gains made in the global effort to fight hunger. “If we are to achieve a world without hunger and malnutrition in all its forms by 2030, it is imperative that we accelerate and scale up actions to strengthen the resilience and adaptive capacity of food systems and people's livelihoods in response to climate variability and extremes," the heads of FAO, the International Fund for Agricultural Development (IFAD), the UN Children's Fund (UNICEF), the World Food Programme (WFP) and the World Health Organization (WHO) wrote in a joint foreword to the report. Undernourishment and severe food insecurity has increased the most in African regions, where some 256.5 million go hungry and nearly 30 percent are in the “severe food insecurity” category. But it’s not just Africa that’s causing concern. The situation is also worsening in South America, where some 39 million people aren’t getting enough to eat. In Latin America, severe food insecurity has increased to just under 10 percent. In Asia, while improvements had been improving the situation, those improvements seem to be slowing down now, according to the FAO. Projections for Asia for 2017 were at 11.4 percent for prevalence of undernourishment. That represents more than 515 million people. On the flip side, only 1.4 percent of the population in North America and Europe is defined as facing severe food insecurity. And then we have to take into account that hunger is only one form of malnutrition. It’s not just how much food you have—it’s what type of food is available. The latest UN report titled “The State of Agricultural Commodity Markets 2018” released on Monday attempted to identify where global harvests will rise and fall by 2050. 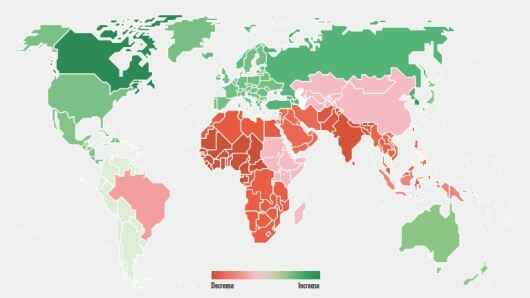 The report predicts that declines will most likely be in West Africa (2.9-percent drop in farming yield) and India (2.6-percent drop in farming yield). In the reverse, Canada, Russia and the United States are likely to grow their exports and output by 2050.